Roman Dress Size 18. Dispatched with Royal Mail 1st Class. Missguided Women's Strappy Bodycon Dress, Pink - Size 10. Condition is Used. Dispatched with Royal Mail 2nd Class. Strappy floral dress. Knee length. Very sweet with buttons at the top. Multi coloured floral A Line Jersey Dress. Blue with 3/4 sleeves. Shoulder to hem length approx 32". Dancing Leopard Women's Dress, Size 12. Condition is Used. Dispatched with Royal Mail 2nd Class. Stunning tunic dress with lots of detail. Blue grey print, really nice. Large front pockets with trim. 18" pit to pit. No bobbling or signs of wear. Kit patterned maxi dress, Size 12 excellent condition. Dispatched with Royal Mail 2nd Class. In The Style Size 12 White Bodycon Dress With Criss Cross Back. Really lovely for a night out or even for a formal event. Condition is used but in very good condition as only worn once. Dispatched with Royal Mail 2nd Class. Missguided Women's Strappy Bodycon Dress, black, worn once - Size 8. Condition is Used. Dispatched with Royal Mail 2nd Class. Pretty White Stuff tunic in very good condition. Simple flaring pull-on style with wide cowl neck, bust darts. Cap sleeves and notches at sides of hem. 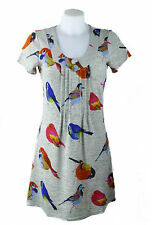 Light blue cotton weave fabric with colourful birds and flowers print. Pattern Bodycon Dress Size 14. Dispatched with Royal Mail 2nd Class. Floral Women’s Skater Dress Size 8 Blue, pink and white floral design. Spaghetti straps that cross over at the back. Low cut, zip fastening. Originally bought from TK Maxx. Condition is Used. Dispatched with Royal Mail 2nd Class. Any questions, let me know! Pink Vanilla Strappy Bodycon Dress, dusky pink Size 12. Pink Vanilla Strappy Bodycon Dress, dusky pink Size 12. . Condition is Used. Dispatched with Royal Mail 2nd Class. This is a pink vanilla dress not a miss guided and its a block col not floral. For some reason the discription automatic filled in with wrong details and wouldnt let me change them. Asos Mickey Mouse Pompom Jumper Dress. Condition is Used. Dispatched with Royal Mail 1st Class. Missguided Women's Strappy Bodycon Dress, Pink - Size 10. Condition is New with tags. Dispatched with Royal Mail 2nd Class. OTHERWISE, THIS JUMPER DRESS IS IN GREAT CONDITION. I BELIEVE THERE IS NO PROBLEM THAT CANNOT BE RESOLVED AMICABLY. 19" - SHOULDER TO SHOULDER. 26" - SLEEVE LENGTH (SHOULDER TO CUFF). Missguided Women's Strappy Bodycon Dress, Pink - Size 14. Condition is Used. Dispatched with Royal Mail 2nd Class. WORN ONCE! MISSGUIDED Grey Bodycon Dress with Knot design on the front UK S. Condition is Used. Dispatched with Royal Mail 2nd Class. Blue Bandage Style Dress With Shoulder Embellishment Size 12. Condition is Used. This is NOT by misguided but it won’t let me remove this. Only worn once so in excellent condition, very unusual dress very flattering . Dispatched with Royal Mail 2nd Class. Multicoloured floral short sleeved, round neck, long dress. Shoulder to hem; 40". Pit to pit; 22". Used but in excellent condition.